stash this week and now I'm on to winter themed cards! and lightly rubbed my white pigment ink pad over it for a frosty look. Lovely Winter card, the inking of your embossed background is perfect. (I'm afraid I would have ink all over). 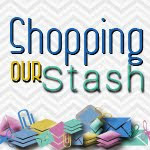 Thanks for joining us at Shopping Our Stash for the Winter Wonderland challenge. Super cute card-- and happy 1st day of winter! This will be a great greeting to have on hand for the next 3 months... lol! Thanks for sharing at SOS this week, too!